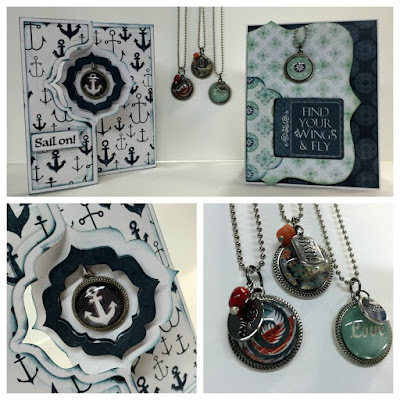 Blog Quick Quotes: Jewelry Inspiration with Alicia! Good morning Quick Quotes readers, Alicia posting some off the page creations today! I recently purchased some glass and trays to make charms. I had so much fun finding scraps among my Quick Quotes papers and stickers to create these sweet necklaces. First, I made all 5 charms, then I decided I didn't want them all to be necklaces. I used the anchor as a centerpiece for a flip it card. I kept the others necklaces but incorporated one into a gift card for double duty! For the gift card, I used one of the necklaces I had created and incorporated it into a card. 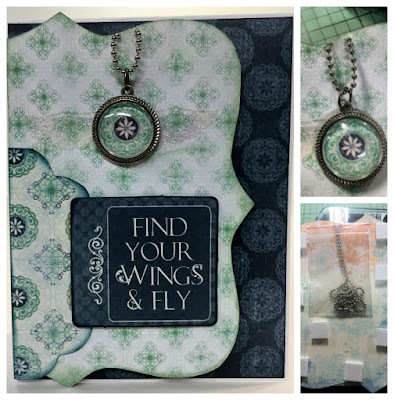 I used coordinating Farmhouse papers and popped up the topper on pop dots to have room for the necklace to hang between that layer and the base of the card. I put the chain in a zip lock to keep it from hanging out the bottom. I cut a couple of notches in the paper to hold the necklace in place. I also used Versamark ink and a clear embossing powder to make some transparent wings. I hung the necklace right over the center of the wings. It is subtle but really fits with the chipboard sentiment.